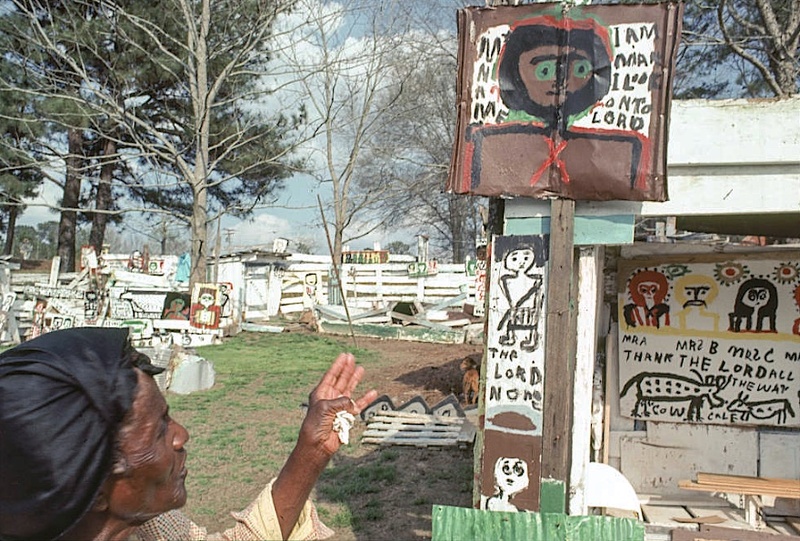 From the late 1960s through the 1970s, after the assassination of Martin Luther King Jr., a remarkable cultural phenomenon unfolded in the southern United States yet went almost unnoticed. As if in unspoken response to a trumpet’s reveille, black people throughout the region came out from their houses, or factories, or in from the fields, and intensified their creation of artistic environments, or “yard shows,” so the outside world could see what had been previously expressed in secrecy inside and behind their residences. It had been there for centuries, this yard-show tradition, but almost no one outside the culture knew about it, this not-for-our-eyes cubism, fauvism, expressionism, surrealism, dada, abstract expressionism, pop, minimalism, graffiti, postmodern, neo-this, neo-that, neo-everything. Or proto-everything. In the 1970s Eldren M. Bailey came out, as did Vernon Burwell, Sam Doyle, Ralph Griffin, Lonnie Holley, Joe Light, Nellie Mae Rowe, Purvis Young, and so many others–too many to count, and so many we never knew about. Also in that decade Mary T. Smith decided to start expressing ideas that had been in her head since childhood. With a private space that was hers to create, to define, and to decorate, show would spotlight herself for the world surrounding her. It was a world of people who had at their worst laughed at her and been contemptuous of her, and at their bet had simply tolerated her as someone who was different and insignificant. Now it was Mary T. Smith’s turn. Smith left home in her teens and entered into a brief marriage with a man named Gus Williams. The marriage lasted two months; after she caught him deceiving her, she left. “Anybody that tells that big a lie, I can’t stay with,” she told her family. She then went to work for a white family in Wesson, a few miles from Martinville. She lived in their house. She washed, cooked, and cleaned for them. After a few years there, she met and married John Smith, a sharecropper, and moved into his cottage on two acres of potatoes and peanuts. This marriage, like the first one, ended abruptly. When her husband’s year-end settlement was given to him, Mary Smith realized that the amount was drastically insufficient. She had meticulously recorded all the data concerning her husband’s labor. She told his boss, “We only got $17. You must have made a mistake. $1,154 supposed to come to us.” The boss ordered John Smith to rid himself of his spouse. John Smith acquiesced, packing Mary Smith’s belongings and sending her away. The boss brought him a new “wife,” and Mary Smith, in her thirties, moved to Hazlehurst, the largest town in the immediate area, to figure out her life. In Hazlehurst, Smith worked as a domestic servant and gave birth to her only child, Sheridan L. “Jay Bird” Major, in 1941. Though she did not marry the father, be built her a house where she lived and raised their son. That house—a neat wood bungalow on a one-acre lot, sitting beside the main road through Hazlehurst—gave Mary T. Smith a new beginning. She was finally independent—at least to the extent that she had a home, work when she wanted it, and access to fields for growing all the vegetables she needed. Near her house was a garbage dump, piled with discarded corrugated tin—strong, interesting material, free for the taking. Smith dragged home piece after piece of it, day after day, and with an ax she split off strip after strip. She then split some of the strips into smaller strips and some of the smaller strips into even smaller ones, and with the deft improvisational sense of the best quilter or the best assemblage sculptor or jazz musician or poet, she marked her space with a fence of whitewashed corrugated tin strips, providing herself with the ever-presence of a continuously running jazz symphony or epic poem, or the world’s longest strip quilt. Like Penelope weaving her never-ending tapestry while awaiting the return of Odysseus, this was a woman ready to make a statement. She had additional ideas for the area within the fence. Like a landscape architect, she created spaces with spaces, unpredictable, surprising, metaphorical, symbolic spaces, some chaotic, some studiously ordered, some color-coordinated, some manicured; they were Mary Smith’s version of the world, the world she had perfectly figured out, the sacred and profane world of Copiah County and planet Earth. Gradually Smith’s space began to fill with art. She had earlier constructed a series of outbuildings and furnishings within the space–doghouses, storage huts, tables, and benches, and later a de facto “studio” in which to work and display her mot recent paintings. The buildings themselves were works of art, wood and tin sculptures usually painted with inventive patterns and designs. Her love for Jesus was present throughout her environment. She painted numerous portraits of him and conceived a variety of ways to depict the Christian Trinity. Religious iconography appeared in abstracted form all along her fence. One distinguished painting, consisting of circles and lines in red on a blue ground, is actually an abstract Last Supper—"Jesus’ Supper," she called it. Many of her paintings are like expressionistic Byzantine icons. An old board, a chrome circle, and a square piece of tin painted with the word HE became one of the most unusual images of Jesus ever created. Smith’s use of the circle is repeated in many other works, notably an untitled sculpture that once adorned her front porch, and I Love the Name of the Lord, where the concentric-circle motif seems derived from the sun, a presence in southern Mississippi almost as all-pervasive as religious faith. Although the exact meaning of this image is unknown, its reappearance throughout her work underscores the consistency of her cryptic imagery and implies a similar consistency for her opaque anagrams and coded letterings. Smith was fascinated by patterns and designs, which became, for her, conveyors of information. She could present an idea to the world by writing a slogan on a painting. Or she could express the same sentiments with a script like constellation of tin or wood fragments. Or she could identify the thought with her private and altogether consistent symbolism: the circle within a circle; or a sunburst like aura; or a series of vertical or horizontal strips; or a seemingly random dot pattern; or words that were not words at all, but were words—for example, Buzyk = Jesus (on one occasion). Painted and written scripts and slogans were also an integral part of the yard. Though Smith was capable of legible printing and cursive writing, she wrote on many of her paintings with inscriptions that were seemingly unintelligible. This may have been an attempt to play into the town’s perception of her as ignorant or crazy, thereby affording her a degree of privacy and, hence, security. The inscriptions, especially those on religious paintings, seem to belong to a purposeful and meaningful system, and like John B. Murray with his quasi-writing, Smith probably understood thoroughly her invented words. 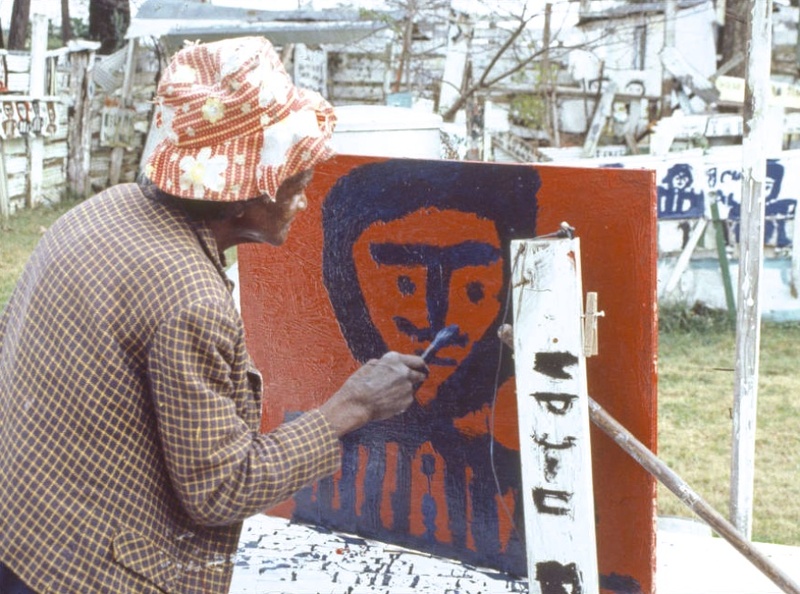 In other cases her “writing” seems simply an improvisational almost formalist use of letters and script as elements of design, a technique employed for centuries by African American quilters, for example. The yard was filled with other symbols and sign understood only by their maker. All around the environment Smith created sculptures of human figures—literal ones constructed of poles, buckets and pails, and paint can lids. Designed with things in mind besides the shooing of birds, her scarecrows frequently stood inside the yard, beneath trees, in corners of enclosed spaces, far from the corn and other vegetables that grew in the fields adjacent to the yard. Towering above her property were two large billboards that changed regularly and advised travelers along State Highway 51 what to do with their money. A smiling bank teller suggested a deposit. A new Oldsmobile told you where to purchase one. A petroleum company told motorists to put a tiger in their tanks. That is how one gets a message across: Attract attention with a picture (a face, an object, an animal) and accompany it with words. Down below the billboards, Mary Smith decided that she could compete, and she counter-advertised herself and her worldview. Smith also used her yard as a very personal and private record, a diary of her life, which she presented publicly. She often painted portraits of herself, as well as of her relatives and friends. Elizabeth says, “She was drawing all of us. She told me, ‘That’s you. That’s your children. That’s your grandchildren.’” Mary’s son, Jay Bird, says, “Her inspiration came from the Lord, and originally she mostly painted Jesus, and Moses once, but later she moved to painting the family and neighbors.” She also painted visitors, recording them as in a guest book with portraits and occasional inscriptions (“We from New York” and “We from D.C.”). One painting records a specific event, a visit by two friends to her house (“I see 2”). Smith depicts herself standing in her yard greeting them. That part of her yard is rendered in accurate detail: the expanse of grass, enclosed spaces, trees, the fence. 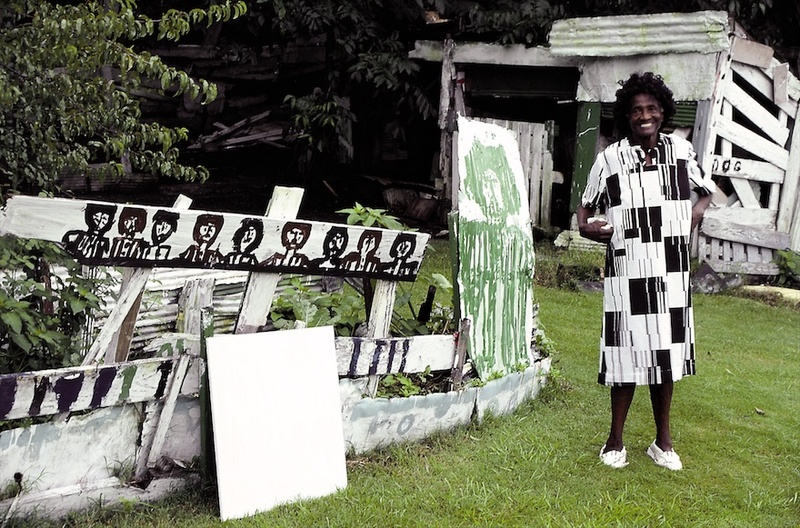 Though nature provided her with an abundance of trees and flowers, Smith added her own creations, painted on vertical pieces of tin and wood and long tin strip “baseboards” throughout the yard. (Smith wanted to add contributions from her own hand to the natural landscape.) She also created special spaces for her pet dogs and cats and embellished their areas with patterning similar to that found on her religious paintings, as if to say, Lord, protect these animals. When a mother cat was unable to feed her newborn litter, Smith executed a painting of the animals with a written reminder to herself that she must not forget to buy milk for the kittens (My Mind Has to Do It). As with all advanced improvisation, Smith’s was never an unmodulated, let-it-all-hang-out, instinctual process, but rather a mixing of careful planning with retrospective and prospective painterly performance–an act of looking back (in time or space) and looking forward at the painting. One untitled work contains sequential applications of black paint, then orange, then more black, and then red paint. Their effect restrains the orange, the piece’s most aggressive color. A resulting tension between the black and the hot colors is tightened by the use of black both to underpaint and to partially efface the orange figures. Notice as well that all five faces’ features are created with different combinations of colors. Written inscriptions, vigorous brushwork, and virtuoso color were not her only expressive tools; she also could dress her message. An interesting relationship existed between Smith’s wardrobe and her art. In her closet, Smith kept an extensive dress collection defined, as was her yard, by juxtapositions of the spiritual and the mundane. These dresses reflected her every mood and thought. They hung in her closet, compartmentalized, sacred and profane; quiet, solemn spirituals sung by Marian Anderson; boisterous celebrations of life by Louis Armstrong, Little Richard, B.B. King. When she felt pious or humble, when she would draw a picture of a simple little house with a tiny lone occupant and accompany it with a statement of ultimate humility—"My name is someone. The Lord for me he no”—or when she would paint Christ surrounded by spots of blood, she would dress in white–the traditional domestic servant’s outfit (it was called a “uniform”) or a nurse’s attire—to serve God or to try to heal us all. When she painted a portrait of a friend with orange and green house paint, or other lively multicolor tributes to her dogs and cats, or when she felt like chastising us for our shortcomings (“On face is all righ to face wont do” or “The Lord know ho is good and ho is baid and ho tells lies”), she cam out in explosions of color, flashing, zigzagging, speaking her piece, standing her ground. She stood her ground until 1995, when she died at the age of ninety-one. 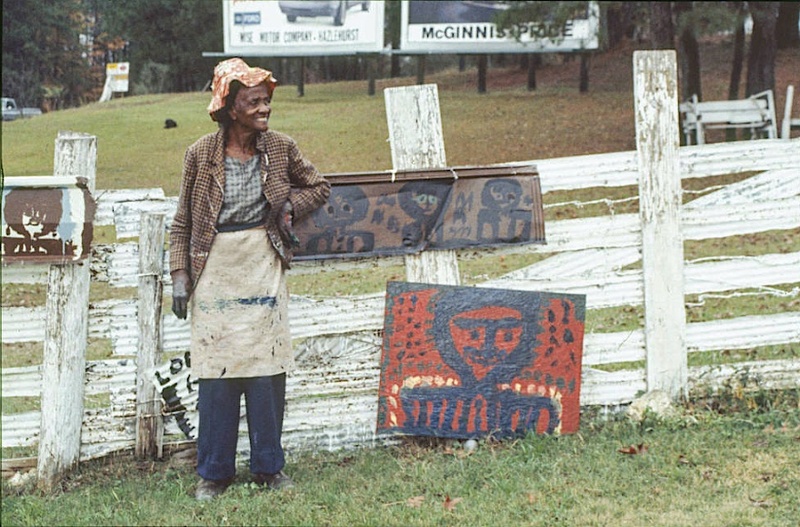 A poor, black, uneducated, hearing-impaired daughter of a sharecropper had become a major artist exhibited and collected throughout the United Sates and included in almost every important “folk art” show. Mary T. Smith then must be one of those success stories for which this nation has become famous. Alas, there is no such good news. The system still has flaws. When I notified the proper authorities in Mississippi in 1987 that I believed Smith’s yard represented an important cultural site in need of preservation, and offered to take the financial initiative to do so (with the state's assistance), I was told that “Smith is considered an eccentric artist who does not fall under any of the categories of folklore that interest the state.” Smith died penniless. 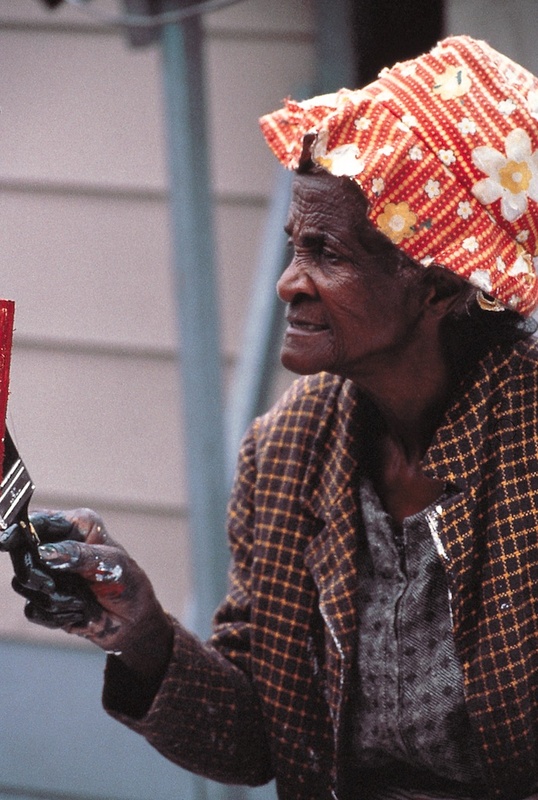 When she had stopped painting around 1990, her income had begun to dwindle. Her burial insurance had been canceled a few months before her death. The funeral home threatened to dump her body into a pauper’s grave. The family found a distant friend to pay for an honorable casket and burial. The funeral home pocketed the money and buried her unceremoniously in a cheap pine box. It is all very familiar. 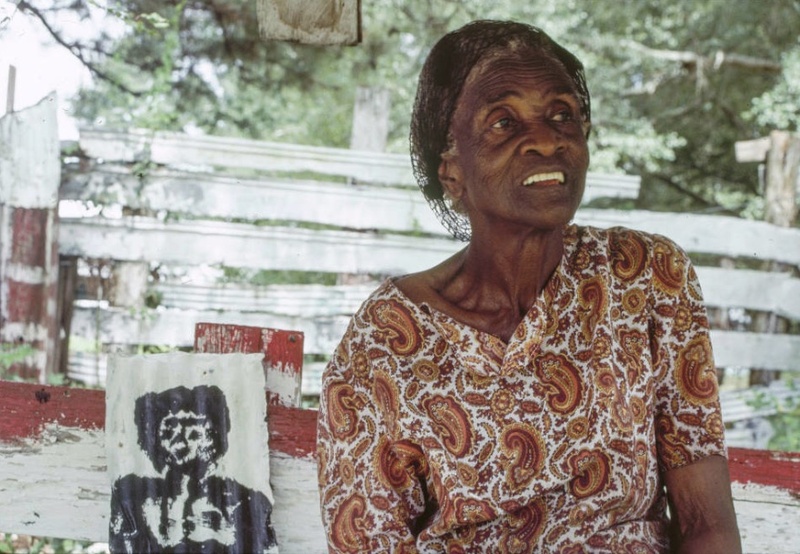 Listen to black Americans who were born in the rural South at the turn of the century: their stories often seem interchangeable. But everyone knows that. Everyone knows abut the pain and degradation, the exploitation. Separated from it as most people are–by space, time, race, and personal experience–they can know it and not feel it. They can intellectualize the history but not allow their consciences to process it. But look closer at the victims, and amazingly they do not act like victims. There is an unfathomable absence of self-pity and an unparalleled talent for smiling, saying a “yassuh, boss” (when there was no reasonable alternative) and moving on, unscathed in spite of the taunts, the threats, and the terrorism. The system may correct itself. It sometimes does. Artists, and citizens, might one day be rewarded according to their talents alone. If the best museums displaying twentieth-century art were to display the best surviving twentieth-century art, the world would know this woman. Her name is Mary Tillman Smith, and she is someone. Information and quotations in this essay are taken from interviews with Mary T. Smith, Elizabeth Alexander, and S. L. Major by William Arnett during 1986, 1987, 1988, and 1995.